But then it started raining, the weather was cold and miserable and I was sorely tempted to go straight home. It was like my son read my mind and said: Ah Mom, can’t we just go home? In that split second I glanced across at him and then back at the road and had a light bulb moment. He was waiting for me to make the right decision. What was the right decision? I knew this was a defining moment, however small. I decided to do the right thing vs what I felt like doing so I could set an example for him. Now I don’t want to sound all too serious and precious, and there will be days when I’ll actually just go home, but it all depends on what it is that you’ll be skipping. Somehow over the last wee while, a person’s Word has lost it’s value. Nowadays we tend to be more fluid with our commitments, excuses seem to flow easier or simply not at all, and we generally have an attitude of doing what we want when we want. I find that pretty sad and the older I get, the more “old-fashioned” I become in terms of values I was taught as a child. I explained to him about us having made a commitment and people were relying on us to keep our word. I agreed that I would personally rather have gone straight home, but I explained how important it is about people being able to rely on you, and how that leads to Respect, not only for each other, but also for ourselves. The whole “Treat others as you want to be treated” adage comes to mind. We’ve had birthday parties where people RSVP they are coming and don’t pitch up. We’ve had team events where people don’t make appropriate or timeous apologies for not being present and as kids get older, they can see and understand first hand the impact on team members when there aren’t enough players and everyone has to work harder, gets more tired, and more often than not, might lose the game. The point isn’t about winning or losing, it’s about your word meaning something and being there when people are relying on you, or have catered for you. As we move through school, I’m waiting for the day when he’s agreed to a sleep over or play date or whatever, and something “better” or more enticing comes up. How will I prepare him to be able to make the “right” decision instead of the”popular” or “easy” option? I don’t have all the answers, but the first step is by me setting an example. Sometimes there are valid reasons why plans change, but communication is always key. And it’s not about having to explain your life story to people, it’s just about (a) doing what’s right, and (b) excusing yourself from something if there is a valid and very good reason. 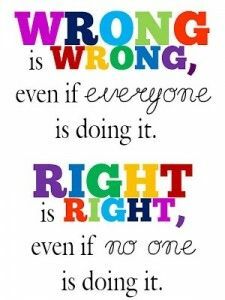 It’s not enough to know what the right thing is, it’s having the strength of character and Integrity to actually DO the right thing. Image courtesy of http://www.technologyrocksseriously.com/ – I discovered this very talented lady by accident and she rocks!